­­­Welcome to the Freedom Boat Club of Lake Erie – Huron, Ohio! Freedom Boat Club Lake Erie (FBCLE) was founded in 2009 by Beckett and Jim Spreng. Freedom Boat Club Lake Erie has four locations – Huron (Huron Lagoons Marina), Catawba Island (Catawba Landing Marina), Rocky River (Emerald Necklace Marina), and Cleveland (Channel Park Marina). As a Member of Freedom Boat Club Lake Erie you receive unlimited access to all four locations. You also enjoy free reciprocal boating privileges at more than 175 other club locations throughout North America, Canada, and Europe. 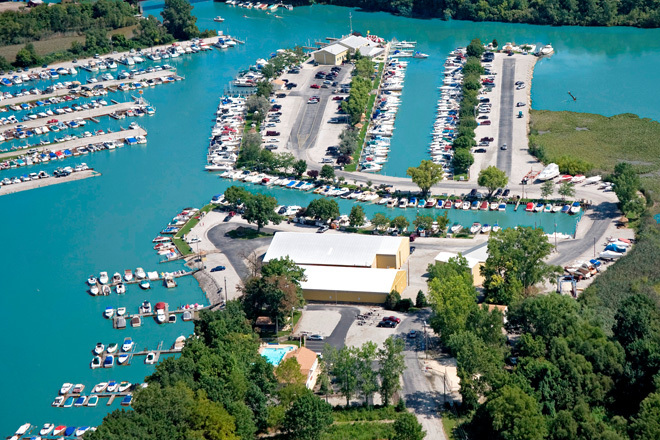 Huron Lagoons Marina: Huron Lagoons Marina (HLM) is Huron's largest full service marina. HLM is located in Erie County on the Huron River, less than 1 mile inland from Lake Erie and easily accessible from Rt. 2. Access by water to Vermilion is only 7 miles; to Cedar Point and Sandusky only 7 miles; and the Lake Erie islands are 14 miles away. Huron Lagoons Marina is Huron's largest full service marina. HLM is situated on the protected waters of the Huron River. You can spend hours cruising over 8 miles of the scenic river. Local beaches are only a few minutes away. HLM, a 350 slip marina, features dockside parking with grassy picnic areas, a ship's store, laundry room, game room, sand pit volleyball and a basketball court. Thunderbird Hills, a 36-hole golf course and driving range, is within walking distance. FREE WI-FI connection is provided throughout the marina. The Ships Store is stocked with all of your boating needs and the latest in marine electronics. They also have a fuel dock, live bait, minnows, and night crawlers. The marina's Viking's Den restaurant provides dockside dining with nautical ambiance while you eat. Enjoy the view of the scenic Huron River as you dine on their patio deck or relax inside in the air-conditioned den. Dockage is handicap accessible. FBCLE Members have the opportunity to join the Laguna Yacht Club (LYC) for $250 Initiation fee, with annual dues of $200. The LYC membership includes 24-hour access to the HLM Pool Complex (May through September) and affiliation to Interlake Yachting Association and Yachting Club of America, which entitles members to visit other clubs around the Great Lakes and country.